Chart of a Media Professional as per Astrology. Today is another article on various professions as per Astrology. It is regarding chart of a Media Professional. It can include people working on TV, Movies, Theatre, YouTuber, News Anchors and other Creative Artistes. Due to advent of Social Media, scope of this topic is very high but we can cover only the generic planetary position which can take someone in Media World. 3rd house – 3rd house is house of hobbies, interests, skills and communications. Normally, people working in media always had such an interest from childhood. 5th house – 5th house is main house of creativity, creative pursuits, media, arts and cinema. 7th house – 7th house is house of masses and people. It would show how popular one can get by following his creative pursuits. 8th house – 8th house is house of serving other people through whichever means. So, it can be through creative means too. 10th house – As it is main house of career and work. 12th house – 12th house represents creative imagination and working behind the scenes. Hence, it is more relevant for someone as a Director or someone who works in media but remains behind the scenes. Gemini – Being the 3rd sign, it has energy and representations of 3rd house as discussed above. Leo – It is the main sign of creativity and creative pursuits. Being the 5th sign, it has energy and representations of 5th house as discussed above. Pisces – A sign of creative imagination as it is 12th sign and represents 12th house energy. Sun – Sun is the main creator. So, Sun represents creativity 1st of all. Venus – Then Venus is another planet and karaka of Creativity and Creative Pursuits. Mercury – Mercury is karaka of skills, interests and talents. Mercury-Venus – Mercury-Venus combination through conjunction, aspect or exchange in any horoscope will make someone extra creative and make them follow their creativity. But this combination can easily create someone who is shrewd about wealth and finances. Rahu – Rahu represents uniqueness and to create unique things daily, you need to be very creative. So, Rahu represents Creativity. Rahu-Ketu – As they both represent illusion, when they come in someone’s 1st house/7th house axis, these people become very good at throwing illusion at others. It means they can be very good at acting. Magha – It is a nakshatra of Celebrities as it is part of Leo. Purva-Phalguni – It is a nakshatra of Creative Talents as it is also part of Leo. Chitra – Its literal meaning is Picture and represents creative people. Dhanishtha – A nakshatra connected with music and musical instruments like Drum and Flute. Revati – Revati is nakshatra of creativity too as it is part of Pisces. Various Combinations - Now, any combination between these houses, planets, signs and nakshatras can create a Media Professional. Any combination between these planets, houses, signs & nakshatras where energy exchanges between them will be enough to make a Media Professional in proper dasha time. Atma Karaka or Amatya Karaka - If Sun, Mercury or Venus becomes person's Atma Karaka or Amatya Karaka, then things can be more prominent to become a Media Professional as these planets represent creativity, talents and interests. Mahadashas - But as always, dashas will activate houses or planets and person will have realization at that time to take up Media as Career. Example Chart – Who else but Amitabh Bachchan’s chart!!! 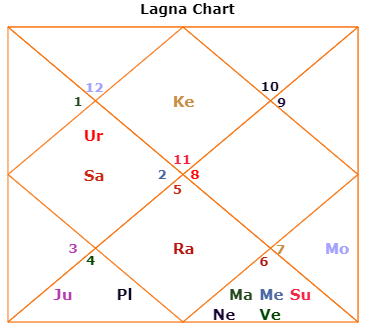 Ketu in Ascendant and Rahu in 7th house – It makes him good at acting and throwing an illusion at masses. 8th house – Most intense and dark house. He became a superstar by playing roles of Anti-Hero, the one who has anger against society and wants to change (8th house) things. Virgo – A sign of perfection and as we hear from media, he remained a perfectionist professionally throughout. As they say, he is Director’s Actor. Give his dues and he will give the perfect job which any Director would love to receive. He remained very professional and practical about his work. Mercury – Represents Skills, Talents and interests. Mercury is also his 5th house lord and Amatya Karaka. Mars – 3rd house and 10th house lord. So, if we see all planets related with creativity and house lords of creativity came together in 8th house of serving other people. Venus was debilitated but it was receiving a Neech Bhang Raaj Yoga due to Mercury being exalted. This yoga would help in professional life at least. He has Rahu in Magha and Sun-Mercury (Atma Karaka & Amatya Karaka) in Chitra. That’s how a chart which prima-facie looks like the chart of an occultist, turned out to be chart of a great actor. Things could have totally changed if Rahu-Jupiter were there in 8th house. Last but not the least, he got his major success as soon as Saturn MD started in 1971. It is because all these 4 planets in 8th house/Virgo are 5th house away from Saturn in 4th house/Taurus. So, if we make MD planet Saturn as ascendant, all 4 planets of 8th house actually fall in 5th house and gave him results of 5th house of creativity, arts and media. Saturn MD also made him persevere through immense hard work (sometimes working in 3 shifts at 3 different locations/city within 1 day) to get life long success.